Passengers and crew felt the jolt from the collision at 2:30 a.m. when the ship was nine miles off Winnetka, Illinois. The hole in the port side of the elegant 252-foot side-wheel steamer didn’t appear threatening until all efforts failed to block off surging waters. Unaware of the serious damage to the steamer and worried about leaks on his own vessel, Capt. Darius Malott left the scene and sailed on to Chicago, Illinois, with his cargo of lumber intact. Capt. Jack Wilson, cognizant of the dilemma, handed out life jackets as his vessel continued to take on water. Suffering a gash below the water line, the ship sank within 30 minutes. The once stately excursion boat, heralded as Queen of the Lakes, broke up as its main superstructure plunged to the bottom of Lake Michigan. Survivors hung on for dear life to anything still afloat. Struggling in rough water and pouring rain for over five hours, passengers and crew in two life boats and many on the floatsam drifted to shore where Winnetka’s good Samaritans found them at 8 a.m. The passenger manifest was lost, but surveys revealed approximately 400 passengers and crew were aboard the ship. Close to 100 of them died either in the sinking or the nine mile stretch between the wreck site and shoreline. Another 150 victims were lost within 50 yards of shore as their makeshift rafts hit shallow water rocks and broke apart. Capt. Wilson lost his life while attempting to save two women caught in the surf. 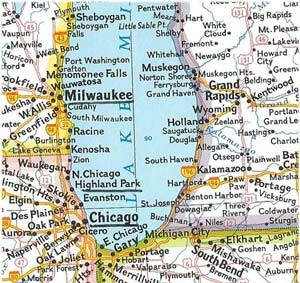 All told, at least 297 people perished in the second worst maritime accident on the Great Lakes. (The steamer Eastland rolled over at a Chicago dock in 1915 killing 835 people). A lookout aboard the Augusta had spotted the well lit steamer 20 minutes before the clash, while spotters on the side-wheeler saw nothing in the direction of the schooner. Sailing vessels weren’t required to have lights and the Augusta was no exception. Later, as a result of the accident, new lighting and inspection laws were passed. Laws and politics played a major role in the Lady Elgin sequel. Many members of one of Wisconsin’s four citizen militias—the Irish Union Guard of Milwaukee’s Third Ward–were aboard having chartered the ship for an excursion from Milwaukee to the Windy City. The Guard had recently experienced a run-in with Wisconsin’s avid abolitionist governor, Alex Randall, who disbanded it and confiscated all weapons in a disagreement over the slavery issue. The trip was a fund raiser for the Guard which involved a parade and speeches promoting preservationist views. After spending the day in Chicago, the Guard and family members returned to the Lady Elgin which left port a little before midnight. Running into stiff breezes and a heavy thunderstorm didn’t seem to bother the passengers, many of whom partied right up until the time of the collision. Many people believed the actions of the governor in enforcing state law led to the ship’s demise. Ironically, laws and politics were destined to return more than 100 years later. That’s when Larry Zych appeared on the scene. Zych, a Chicago commercial diver, discovered the main part of the vessel in 1989 and made a claim on it. He had good intentions for his recovery, but the can of worms he opened created a revolving door of unprecedented courtroom dogma. Today, the wreck is scattered over the bottom of the lake, its debris field extending more than one mile. The main part, including the bow, rests in 60 feet of water four and a half miles due east of Highland Park, Illinois, near Winnetka. What’s left includes an anchor, chain, railings, part of the hull, deadeyes, winches, a capstan, unidentified machinery and more. Still owned by Zych and his non-profit Lady Elgin Foundation, the wreck is listed as an historic site and protected by state law. The Lady Elgin sailed for nine years before the tragedy. The Augusta, considered a pariah by many, was painted a different color and its name was changed to Colonel Cook. True to mariners’ superstitions, bad luck remained with the schooner when it was caught in a storm and sank in Lake Erie in 1888. Note: Some artifacts and photos from the Lady Elgin are on display at the Chicago Maritime Museum and the Winnetka and Wilmette Historical Society Museums. It’s time to get rid of the idea of state claim to ships in public waters that have sunk. A person that discovers it should, however, report his salvage claims. Agree to return personal Items to the family’s if any can be documented. The greed of politicians to claim for the state should be eliminated. The Lady Elgin story is very interesting. After reading it, I was wondering if there was a court case after the collision? It seems to me that the captain of the schooner was at fault. Yes, there was a court case and the captain of the schooner was found not guilty. It appears the collision was his fault, but there was no law then about running lights for sailing vessels. If he had them, the lookout on the Lady Elgin might have seen them and Capt. Wilson could have changed his course. I agree with you, but the politicians locked it in with the Abandoned Shipwreck Act of 1987. Go to Google and read all about this nebulous legislation that a couple of grandstanding politicians managed to push through in Washington. Many of us fought it, but to no avail. It has ambiguous wording, doesn’t define what an “historic” shipwreck really is, and discourages the discovery of shipwrecks by private enterprise. 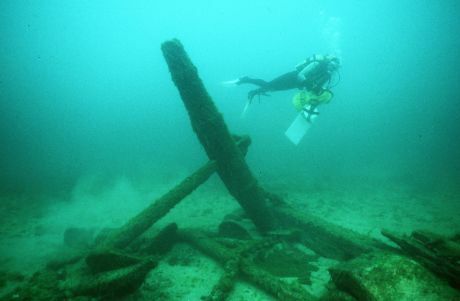 In the Great Lakes, shipwreck status has been an issue since the early 1980’s, when wreck discovery accelerated. Unfortunately, there were many wrecks discretely stripped of artifacts, making the items unavailable for viewing or research in any way. Further, there was the idea that artifacts left in place would attract tourists/sport divers to view. Michigan politicians seemed to put some serious thought into wreck preservation, though no solution satisfies all. It is Harry Zych not Larry Zych. He has passed away but his dreams live on. Thank you for the correction. Sorry about that. And I’m sorry we have lost Harry. He will be remembered as a pioneer, a leader and a hero to many divers. He fought the state bureaucrats, hung in there, and won some battles as he stood tall for free enterprise.